WANTED AND FOR SALE ITEMS: We are also using the Newsletter as a mechanism to list MEMBERS ONLY items for sale or wanted. Please submit all requests for listings to the Newsletter master at: newsletter@inwwoodturners.com All items will be listed ONLY once on request, and if not sold or acquired during that month's newsletter, another request for listing must be submitted. Special items (i.e. lathes may be listed on this page also). All members are being asked to fill out the Survey of Members' Capabilities and Interests and bring it to the next meeting. Let your voice be heard! You have to tell us what you're interested in so we can have the programs you want. And don't be bashful about your capabilities - share with your fellow woodturners - you'll get a lot more than you give! You can quickly change tools, or adjust the amount of tool overhang with any of these handles. Adapters from on brand may fit other brand handles. It is not out of the question to make your own hollow handles. Vacuum Chucking: several people have asked about supplies for setting up vacuum chuck systems. Here is a brief review. A lot depends on how much money you want to spend. Some time and plumbing to your individual machine is needed and there is probably no real plug and play options. 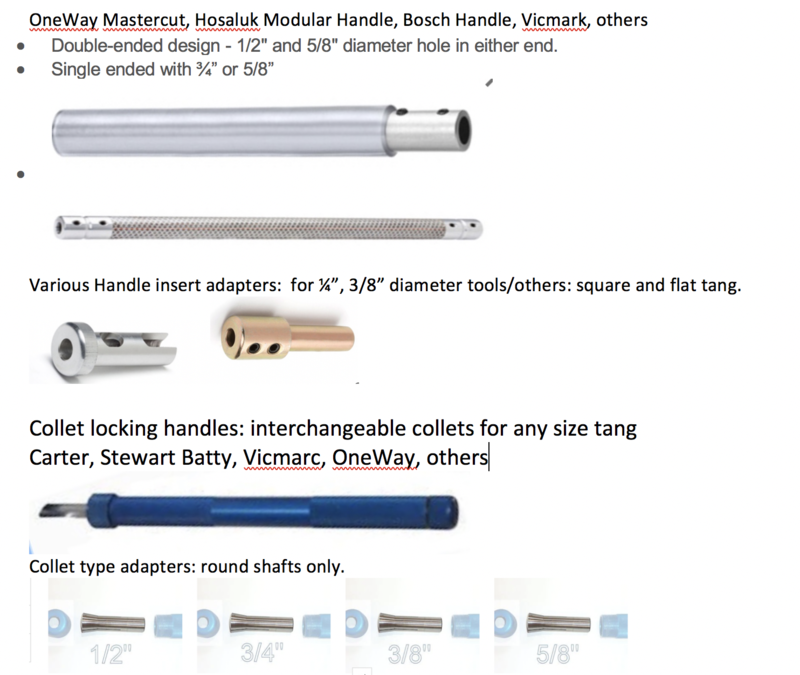 https://www.woodturnerscatalog.com/p/180/6659/Precision-Machine-Rotary-Vacuum-Chuck-Adapter Pick your machine on the pull down. Otherwise, may of us use a through the headstock system, based on a 2 MT headstock internal setup. This is the easiest and most adaptable system, needing only cutting the lamp rod to length for your lathe headstock. You need a vacuum gauge and let off valve: this is one but expensive on this site and this can be sourced/built from stuff at your local hardware store. You need head pieces that actually hold to the piece. Many of us make these with schedule 40 PVC pipe and wood backplates. https://www.woodturnerscatalog.com/p/180/5426/Hold-Fast-3-1-2%22-Vacuum-Chuck-Head Pick your headstock thread on their pull down. Here is a complete autocycling system, minus the pump itself. This site gives lots of information on vacuum systems, aimed primarily on veneer users, but quite applicable to our use in turning. Hope this gets you started. (put together by Carl. Lots of other possibilities exist !). The Inland Northwest Woodturners has a library of books and video media which are available to club members at no cost. See the club librarian at the monthly meeting to check out any items from the library. The list of library materials is here. The following are articles and demonstration materials written by club members which are available for downloading. AAW Video Source is an online tool that offers access to useful online woodturning videos prescreened by the AAW for quality content and safety. The videos are searchable by topic area and keywords, and users are invited to recommend videos for inclusion. AAW's Video Library, offers an expanding online video collection to help to make the learning process more engaging. These videos have been pre-screened by the AAW for quality content and safety. AAW's Woodturning Calendar, offers a schedule of upcoming chapter and demonstrator events, exhibitions, classes, symposia, and more. The AAW Forum is a member-moderated online community ideal for sharing work and ideas, obtaining feedback, and connecting with other woodturning enthusiasts. Separate online registration is required. Have a disability or know someone who has. This video from ICWS talks about those who have disabilities but still turn wonderful stuff! LINKS: On the separate LINKS page, find suppliers, tool and lathe makers, general hardware suppliers, and links of general interest. Links to commercial, for profit, businesses are made without specific recommendation, but have been of value for turning materials by some members of the Club. The Inland Northwest Woodturners website has pages which are for members only. These pages include a directory of members as well as a profile page for each member which the member can customize as they desire. The video tutorials below demonstrate how to accomplish the functions listed. If you have any suggestions or see opportunities for improvement, please submit them to the webmaster on the Contact Us page. The following are videos showing how to access the members' only features of this website. Content visible only for registered users.